STAR TRACE Wet Permanent Magnetic Separators are offered in sizes of Dia 1200mm and 916mm in length of up to 3000mm. Three basic separator designs are available for cobbing, roughing and finishing /cleaning applications. 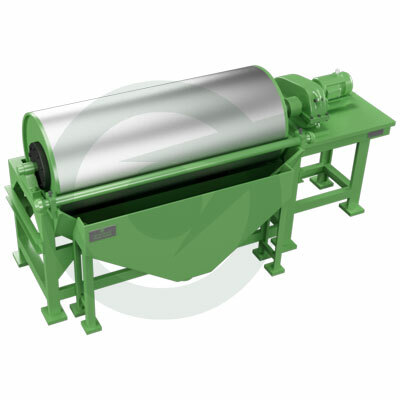 Each type can be supplied in a single drum or multiple drum stages for taconite or magnetite and also for recovery for magnetic medium in dense media plants. The stationary magnet yoke is an assembly of strontium-ferrite permanent magnets. The rotating drum is available with optional rubber or stainless steel covers. The magnetic flux pattern will match the tank configuration for optimum performance. Star Trace magnetic wet separator dia 916 x 300mm is the smallest full scale separator in the 916 series and is primarily used for pilot plant tests. The separator can be delivered in concurrent, countercurrent and counter rotation versions. Star Trace magnetic wet separator for laboratory use have drum dimensions dia. 600 x 285mm and dia. 200 x 100mm and dia are suitable for batch or continuous testing. The test results from the STAR TRACE laboratory separators correspond closely to those obtained in full scale operation.